It is comforting to know that even someone with your skills and experience can have problems making things work! 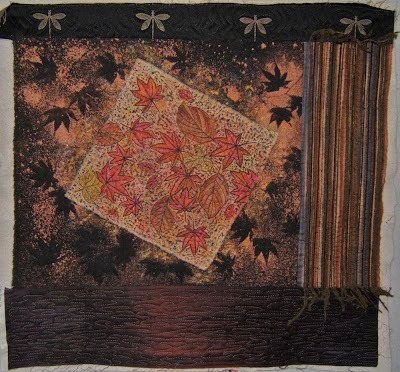 I actually like this piece without the central muslin square, but that takes away your subject for this quilt. I am sure you will resolve it beautifully. I have never done any flower pounding but I like your muslin square with the addition of seed stitching. I'm glad you've found a way to resolve this piece. My husband's mother had Alzheimers and I know the joy of a flash of understanding or connection. As Heather said, it's interesting to read of your struggle to sort this piece out and it's good to know that you've persevered and not given up. I have several UFOs myself that should probably be looked at again! The darker piece also is more integrated with the striped bit on the side now. How did you make it darker? A wonderful solution! Adding the darker notes just brings it all together. Having the added meaning of memory to it makes it so much more special. I liked it when it was just the pounded leaves, Now it is a full chorus. Well done! ps, your postcard is still here..I will be sending it in a week or so, I am so behind!!!! It is hard to just let something "sit" while you think about it. I do like the leaves and background darker. The piece appears stronger too. Nicely done! Now it looks like it belongs, rather than floating on top. I agree with Heather; it's nice to know that it takes you a while to figure things out sometimes, too! Sometimes walking away from a piece from a while is what it takes. When you come back to it later, you know how to finish it. That is now a really meaningful and well balanced piece of art. It pays to think a while before taking final decisions. Oh Wow - it looks amazing together now! Beautiful! Hi Nellie, yes I have been catching up on blog reading and spent a wonderful few hours yesterday reading the past 6 months on your blog .......... especially following "Prairie Performance" from start to finish!! Thanks for stopping by my blog! I've been in awe of your Prairie work for quite awhile, wow, to see that piece hung must be thrilling. Also, I enjoy your "thing" for Elvis. The leaf piece is very meaningful to me; mom has started collecting leaves and twigs from the yard when she does her afternoon pacing/sundowning. 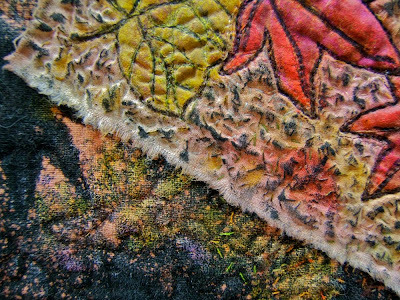 Maybe I'll do something with them such as pound the leaves and add the twigs to a mini quilt. Thanks for the inspiration! If we are quiet and listen, the solution comes to us. Well, if we can get out of our own way! Much better!